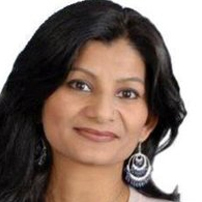 Poonam Joshi is a journalist and broadcaster who is currently the UK and Europe correspondent for ABP News, India’s largest Hindi-language news broadcaster. Apart from her work for ABP News, Poonam Joshi is the Co-founder and Co-editor of The UKAsian, a community news and information portal known for its campaigning journalism. She is also a well-known community activist and founder of Indian Ladies in UK (commonly referred to as ILUK), a more than 14,000-strong community group devoted to the upliftment and empowerment of first generation migrant Indian women in the United Kingdom. Launched in August 2015 as a Social Media group to connect first generation Indian migrant women in the UK, ILUK has evolved into a Community Interest Company. The group undertakes a wide variety of activities aimed at improving the lives of its members – from the hugely successful ‘India Bazaar’, which provides a platform for aspiring businesswomen within the group to providing shelter, safe passage and support to victims of domestic violence and women abandoned by their spouses in India.